Synopsis : Partnership makes over 8000 black cabs in London and a further 2000 throughout the UK fully accessible for disabled travelers. Revolutionary app assist-Mi and black cab app Gett have announced a groundbreaking partnership that offers a new level of accessibility to disabled people traveling around London and more widely across the UK. assist-Mi users will have access to Gett's premium corporate black cab solution, giving them priority booking, and waiting times of less than 5 minutes. Consolidated reporting, including instant email receipts will minimize the hassle of having to compile expenses and/or Access to Work taxi claims manually. Gett's corporate solution also offers fixed prices over longer distances with savings of up to 30% on metered fares. In a busy and ever changing transport environment, and with the prevalence of the smartphone and its increasing capabilities, this partnership offers a disruptive technology as a force for positive change, not only a cheap taxi ride. This empowers the disabled consumer, offering a fully inclusive and accessible London. In line with Gett's position as the only national on-demand taxi app, this will soon be rolled out across the UK. Gett has a 100% black cab guarantee, meaning that the 8000+ taxis that Gett works with in London are fully accessible for disabled passengers, not only those with folding wheelchairs. Over 2000 Gett drivers in other cities across the UK are similarly accessible. In addition, Gett offers a feature within the app to further assist people with visual impairments, enabling them to use pre-existing smartphone technology to order a cab. Disabled travelers wanting to take advantage of this new service can simply download the assist-Mi app, and click on the Gett icon. They will then fill in registration details required for their Gett account and will have their account activated within 1 working day. By registering in this way they will be automatically associated with the assist-Mi corporate account giving them all the added benefits of a premium user. Dom Hyams, Communications & Digital Director of assist-Mi says "I have been working in central London and using black cabs every day for many years as the public transport network can't quite accommodate me in my wheelchair. 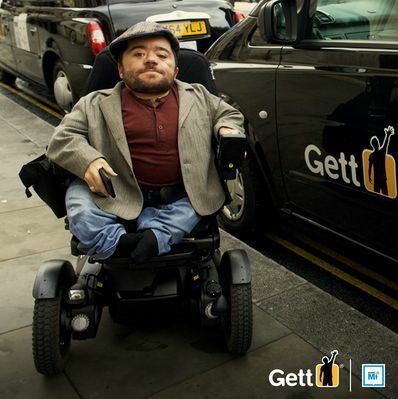 I'm over the moon that we have now teamed up with Gett, so many more people can realize what a fabulous service they provide, and how accommodating black cabs can be to disabled travelers. We are looking forward to seeing where this partnership can take accessible travel in the future"
Dr. Remo Gerber, Gett's MD Western Europe, says "Gett is tremendously proud to partner with assist-mi, if our technology can make people's lives easier then we've achieved our goal. Mobility is at the heart of our business and we believe that there should be no barriers to getting around town safely and with ease." assist-Mi - A comprehensive assistance tool for disabled users on the go, empowering them to greater independence when accessing everyday goods and services. It is available to download free from the App Store for iOS and the Play Store for Android. The brainchild of Gary McFarlane, assist-Mi was founded on his own experience as a disabled person and realizing that the core issue was that service providers did not understand the difficulties faced by the disabled individuals in dealing with everyday tasks. assist-Mi uses a unique, patented combination of simple to use 'smart' location-based technologies and two-way messaging. Requests for assistance or purchasing goods and services can all be made, acknowledged and actioned in real-time. The vision is to empower the disabled individual to greater independence. We aim to connect service providers with the disabled sector and revolutionize assistance and access everywhere. Gett - Founded in 2010, Gett is the premier on-demand app that lets you instantly book a licensed black cab with your mobile phone, and is available for both consumers and corporations. Gett is a $207M funded company and the largest international on-demand player by revenues. Available in 52 cities, including New York, London, Edinburgh, Manchester, Moscow, St Petersburg and Tel-Aviv, Gett features fair, predictable pricing with no surge and live 24/7 telephone-based customer support. Gett offers a 100% black cab guarantee and fixed pricing options, providing users a fast, reliable and convenient way to move around the city.